MONTREAL -- An Ottawa physician who navigated the dangerous roads of Haiti Friday to get to the Port-au-Prince airport with three Canadian colleagues says he feel lucky to be alive and is warning others stranded in the strife-torn country not to follow his lead. 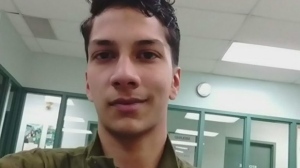 "Please do not do (what I did), because you can get killed," Dr. Emilio Bazile told The Canadian Press from the airport after a harrowing seven-and-a-half hour journey that ended with his group hiring an ambulance driver to secure safe passage. "It was a dangerous game." Bazile and his group, which included three health professionals from New Brunswick, decided they would set out early Friday in two vehicles, hopeful that negotiations between the Haitian president and the opposition would end the protests. But more barricades went up overnight Friday after negotiations failed. "We had false hope that things were going to improve," Bazile said. "That's why we went." Instead, they drove into a lawless nightmare upon leaving Aquin, about 115 kilometres west of Port-au-Prince. They ran into numerous roadblocks and had to detour onto secondary roads. "It was terrible," Bazile said. "You have to pay every time you pass somewhere. You have to pay somebody $500, sometimes they ask $1,000 to allow you to pass." The Canadian government issued a new advisory for Haiti late Thursday, saying Canadians should avoid all travel to the Caribbean country. Global Affairs Canada said it heightened its advisory due to ongoing civil unrest throughout the country. The notice warns that the "security situation could further deteriorate quickly" and that people should "consider leaving by commercial means while they are available." The Canadian embassy in Port-au-Prince has been closed since Wednesday. Quebec Premier Francois Legault announced Friday that 113 tourists trapped at a Haitian resort are expected to be flown to safety Saturday. Legault told reporters in Montreal that helicopters will be used to ferry tourists from the Royal Decameron resort to the airport in the Haitian capital. Air Transat -- the travel company with which they booked vacation packages before violence broke out -- will then fly them to Montreal. Legault said three helicopters with room for 20 passengers each will be deployed. They will make two trips to transport the 113 passengers. Air Transat said in a statement that the evacuation plan was made in co-operation with local authorities, the Canadian embassy in Haiti and the federal government. Earlier Friday, Prime Minister Justin Trudeau said Ottawa and its diplomatic corps were working to help trapped Canadians get home. "We're also obviously preoccupied with a number of Canadians who are in Haiti right now who are looking to come home to Canada in this crisis situation," Trudeau said. Global Affairs didn't provide an exact figure for the number of Canadians seeking to leave. Among them is a team of 26 aid workers with a missionary group from Quebec whose situation remained unchanged Friday. Another 24 missionaries from southern Alberta were in the country to host a women's conference and work on a housing project. A co-ordinator for the group, Haiti Arise, said its people were safe in Grand-Goave, about 65 kilometres from the capital. They were waiting for a chartered helicopter to take them to the airport to catch a flight home later Friday as supplies ran low. "Everyone seems quite positive when I'm talking to them, but you know how it is when you want to go home, and they can't at this time," Michelle Guenther said in a phone interview. 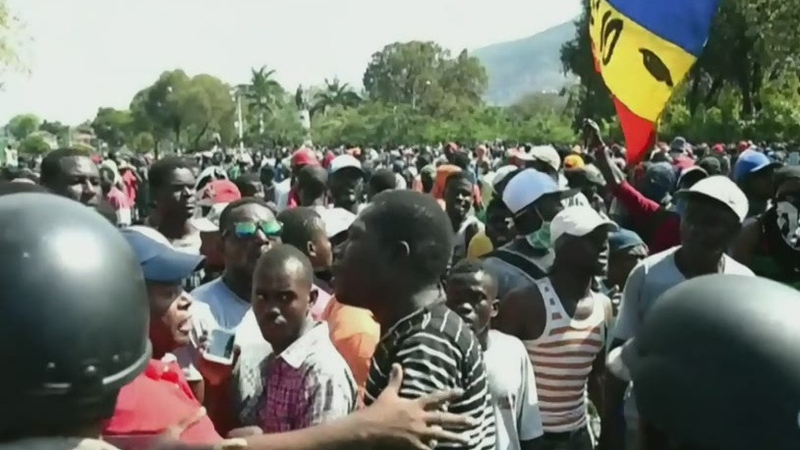 Haitians on Friday vowed to keep protesting until President Jovenel Moise resigns, despite his announcement of upcoming economic measures designed to quell more than a week of violent demonstrations across the country. Protesters are angry over skyrocketing inflation and the government's failure to prosecute embezzlement from a multi-billion Venezuelan program that sent discounted oil to Haiti. Moise said during a televised address late Thursday that he would not surrender the country to what he called armed gangs and drug dealers, and he accused people of freeing prisoners to kill him. It was the first time Moise had spoken since the demonstrations began, and he made another call for dialogue with the opposition. On Friday, the Canada Border Services Agency suspended deportations to Haiti. The agency said the stay is a temporary measure to defer removals in crisis situations and will be removed once the situation stabilizes. A CBSA spokesperson did not say how many people have been deported from Canada to Haiti since the beginning of the crisis. Bazile said amid the chaos, he was most concerned for his Canadian companions, who were very frightened by what was going on. At one point their vehicles were pelted with rocks and glass bottles. "I cried," Bazile said. "When they were throwing things at us, I cried. It looked like there was no end to it, all the bad things. There was no end to it." Taking a break at a home, they heard that emergency vehicles were passing barricades without problem. They decided to order an ambulance to provide safe passage for the final leg of the trip. "We ordered an ambulance, believe it or not, to go to the airport," Bazile said. "We paid US$250 to the guy driving the ambulance -- don't tell me how an ambulance is charging you that." Some members rode inside while the others drove behind. While waiting for the first of a series of flights scheduled to get him home to Ottawa by Saturday afternoon, Bazile expressed relief. "The most important thing -- I'm out," he said. Catherine Davies, a nurse from Woodstock, N.B. who was part of Bazile's team wrote on Facebook Friday: "7.5 hours of a nightmare drive we are safely at the airport."